Dogs are often known as a man’s best friend, but these loving animals can also change the life of a child who needs extra support. 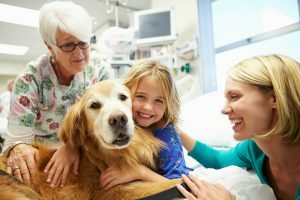 Therapy dogs are more than your average pet—they are trained to provide comfort and affection to individuals in hospitals, schools and in stressful situations. Therapy dogs differ from service dogs. According to the Americans with Disabilities Act, service dogs are individually trained to perform tasks for an individual with a disability. Therapy dogs are used in a variety of settings and care is provided at different levels. First, there is what some call a “meet and greet” therapy dog. “The whole joy of it is interaction,” says Carol Davis, co-founder of Paws’itive Teams in San Diego. Davis and Charli King founded the organization in 1997, which trains both service and therapy dogs. PetSmart Paws for Hope, a “meet and greet” program at Rady Children’s Hospital is designed to reduce the stress of hospitalization for children. The dogs provide comfort and distraction from pain and medical treatments. Learn more about PetSmart Paws for Hope at www.radyfoundation.org/volunteer/opportunities/petsmart-paws-for-hope-program. Sharla Hank says the first interaction between her son and a therapy dog changed his life. Adam, now 13, has Down syndrome and is a leukemia survivor. He was terrified of the dentist until he brought a therapy dog along with him. According to Hank, an adult explaining to Adam what was going to happen was not helpful; it was the warmth and compassion he received from the therapy dog that made the difference. Andrea Bazer used her facility dog, Sunny, while working as an adaptive physical education teacher with the San Diego Unified School District. There were several months of training required for her and Sunny to work with the schools. “[Sunny] helped me extend what I was doing and work more creatively with children,” Bazer says. They worked with children of all ages and varying disabilities. “Children that aren’t speaking will all of a sudden start talking to the dog. They’ll do things for an animal that they won’t do for anyone else,” says Bazer, who has since retired from the school district. She and Sunny still visit the students on occasion. They also volunteer with Paws’itive Teams. Paws’itive Teams partners with facilities and populations who could benefit from therapy dogs, such as young adults with developmental and physical disabilities in the Transition Program at Abraxas High School. The dogs also work at Clairemont High School with students who have severe medical and developmental challenges. At school sites, the handler and dog work directly under the supervision of special education teachers. For families who are thinking about getting their own therapy dog, Davis advises to carefully consider the decision. “[It] is a huge responsibility and can add to the burden of the parent, depending on the severity of the disability of the child,” she says. All those involved in Paws’itive Teams understand how remarkable working with a therapy dog can be. “It’s breathtaking,” King says, especially when she sees children with communication challenges start to talk around a therapy dog. “It’s astounding — the growth and what an animal can do with the child,” Bazer says. To learn more about Paws’itive Teams therapy and service dogs, visit www.pawsteams.org. Melissa Mecija is a freelance writer and mother of two. She is also a reporter/anchor for 10News, the ABC affiliate in San Diego.